I haven’t made a single, solitary new recipe since school started, unless you count party food. This is a new record for me, and even though I’ve been cooking a lot of old standbys, it’s also been two solid months of throwing together whatever random thing is in the fridge. Success varies. I’m starting to pull it together. And I’m pretty sure this was the last new thing I made before the school year snowed me under a bit. 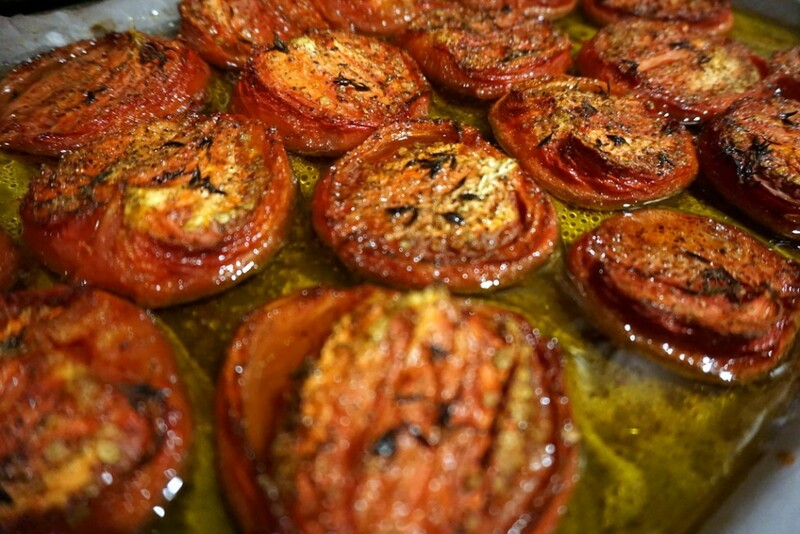 I made tomato confit with the very last of the fresh Jersey tomatoes I found at a local produce stand. Confit is, essentially, slow-cooking something in fat. I used olive oil. And for a few glorious weeks in September, some of my thrown-together meals were slathered with these. Softer than a sun-dried tomato, these taste like the essence of tomato. Like a slow-roasted, homemade ketchup kind of flavor. Not to imply that ketchup tastes like the essence of tomato, but throwing a couple of these sliced up onto a grilled cheese? Eyes-roll-back-in-your-head delicious. I used a Thomas Keller recipe I found on MarthaStewart.com, because when I found that one what else would I use? 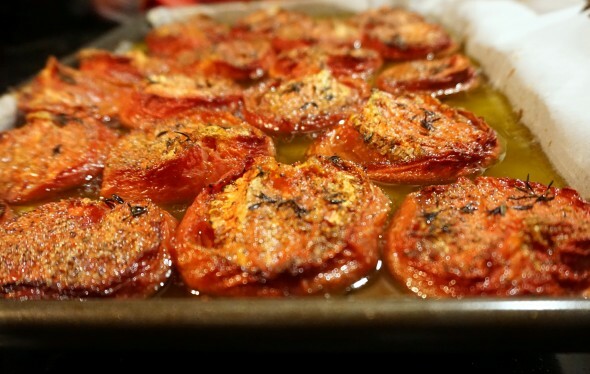 I did not use plum tomatoes, but I still thought these were amazing. I desperately wish I could can a bushel of these and put them up for the year, but everything I read suggested that even if I processed these with a pressure canner I’d probably end up giving everyone I know botulism in short order. So, these will have to be a summer treat. That I’m posting in November. So we can fantasize about them until tomato season next year. Bring a large saucepan of water to a boil. 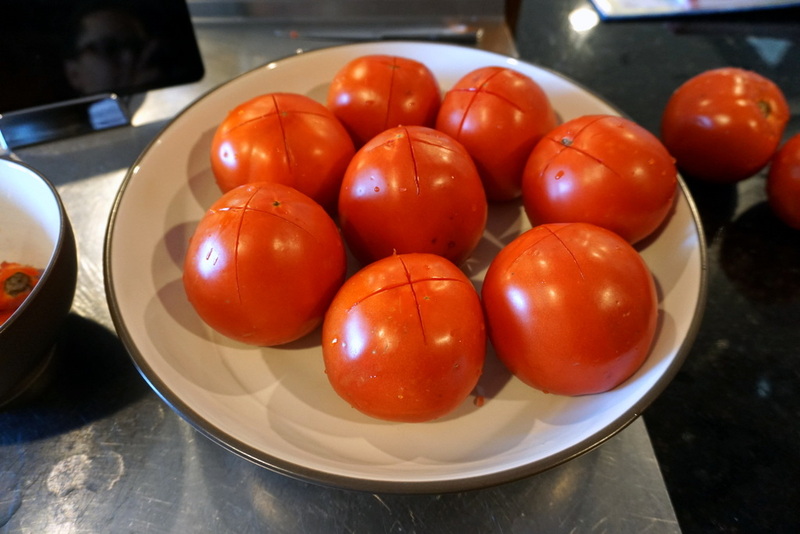 With a sharp paring knife, cut out and discard stem end of each tomato; score opposite end. 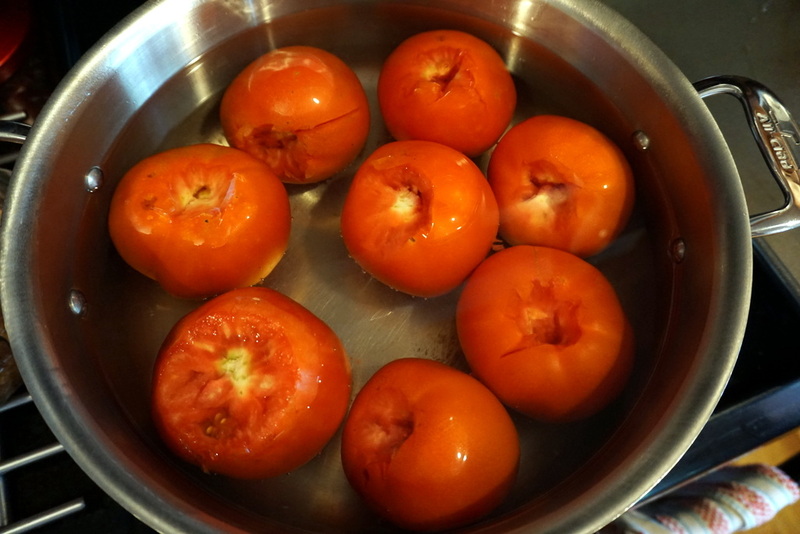 Place tomatoes in a large bowl. Pour boiling water over tomatoes; let sit until skin is easily peeled, about 15 seconds. Drain tomatoes, and cover with ice. **Now, I didn’t get all of my peels off this way, so I did end up submerging mine in boiling water for a bit. Once they get going, the peeling is easy. Peel tomatoes when cool enough to handle. Halve lengthwise and place, cut-side up, on a parchment paper-lined baking sheet. Drizzle with olive oil; season with salt, pepper, and thyme. *Another note: I may have gone overboard with the drizzling. So the bottoms of my tomatoes were softer than I think they would’ve been otherwise. But they were still amazing. Next year, I will drizzle. 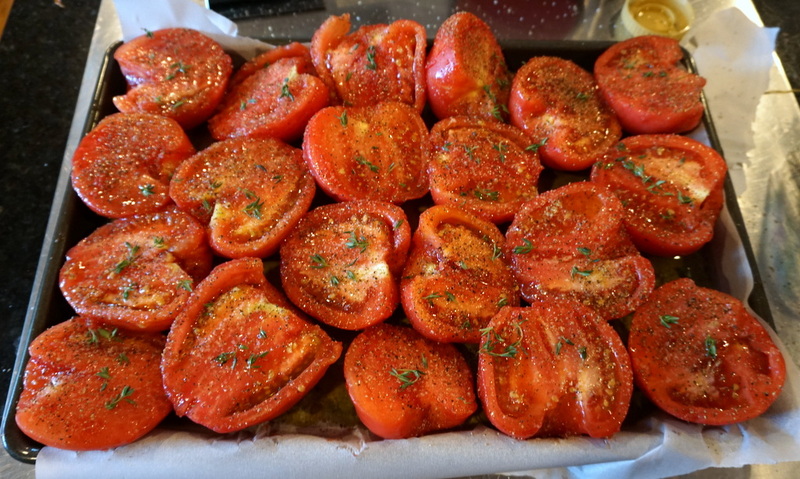 Roast until tomatoes are dried halfway through, about 5 to 6 hours. Let stand until cool. 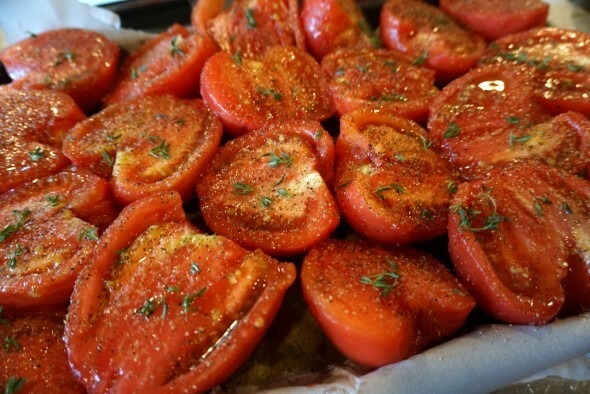 Transfer tomatoes to a storage container; pour oil from baking sheet over the top. Refrigerate for up to 1 week. Mine lasted about 2.5 weeks, and they were glorious weeks. I’ll go back to my rainy November day now.